This book originated as kind of a fluke. I had just gotten married after a whirlwind courtship. Over the next few months, my wife and I were still in the “getting- to-know-one-another” phase of our relationship as we continued to discover things about one another we had never known. Somewhere in that time period, she asked what my favorite pastime was, and I told her it was watching “the fights” either in person or on TV. After informing her what “the fights” referred to, she told me she had never watched boxing which, I have to admit, I found to be odd and out of the ordinary. When I asked her to explain, she told me she didn’t consider herself to be the athletic type; she had no brothers; and her parents had exposed her to things more in tune with what they thought was necessary for a young lady growing up in the suburbs of New York to know. So, any possibility of her being exposed to any sport, including the sport of boxing, by her parents had been out of the question. After hearing this, I had a better understanding as to why she knew nothing of the sport of boxing, the sport I so loved. It was shortly afterwards that I realized that I did, in fact, marry a very special person because although she knew nothing about boxing, she was still “game” to sit with me and watch “the fights” whenever they were on. Yet, due to her lack of exposure to the sport, she had difficulty understanding what was happening in the ring, and what really confused her was the language the announcers used in describing the action happening in front of us. “What do they mean when they say that” or “What does that mean?” were regular comments from her. So, being the type of guy I am, I told her that I’d jot down some words and their definitions so she could have a better understanding of the sport. After several fights and many pages later, it dawned on me that what I had in my hands was a book in the making, so I initially dubbed it, The Wife’s Ringside Guide to the Sport of Boxing. Watching more fights together only made me add more words and meanings to my tome; it steadily grew, as I enjoyed adding more words and definitions whenever a fight was on. Some friends and family members heard about my literary creation and out of curiosity asked if they could read it, which I happily encouraged and supported. They, like I, thought it was different and unique; however, most of them didn’t quite agree with the title as they thought it limited the reading audience to women and, more specifically, to wives. 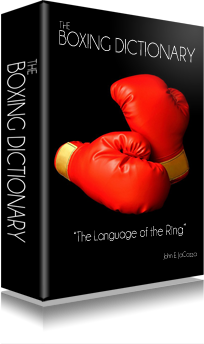 After listening to their opinions and logic for awhile and because I really couldn’t disagree with the points they made, The Boxing Dictionary was born. Over several years’ time I continued to add more words then incorporated a section on phrases; and whenever I watched a fight, either on television or in person, I made sure I had paper and pencil in hand. And, as they say, the rest is history; that’s basically it.